Every three years the world’s foremost experts on mummies – fewer in number but far more dedicated and passionate about their science and its implications than one would expect – assemble from around the world in some remote corner of the globe to discuss and debate the latest discoveries in their esoteric science. 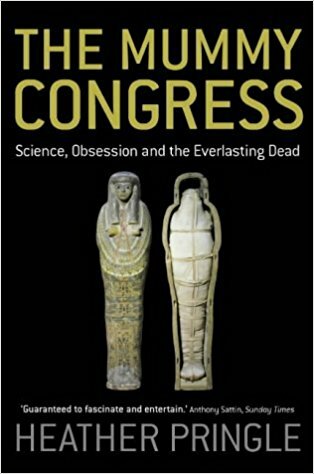 Heather Pringle, Canadian writer on archaeology and science, attended one such congress in Arica, in northern Chile, resulting in this lively, engrossing book. This book has it all – humor, pathos, science, ethics, exoticism, the simply weird. Her account introduces an extraordinary cast of professionals who reveal not only the skills and secrets of the mortuary practitioner but also the fascinating and amazing cultural practices of the once-living and the still-alive alike. They are found in all corners of the world at various time periods. Pringle whisks us from a make-do morgue in the Egyptian desert, where mummies piled in plastic bags harbor weird mummified parasites that may lead to breakthroughs in modern medicine, to Peruvian mountaintops where an archaeologist became a world-class mountaineer in order to find the oldest mummies, such as the beautiful Inca sacrifice Juanita. We peer into the subterranean caves beneath Red Square, learning how dead communist leaders were prepped for immortality under glass, marvel at the self-mummification techniques of Japanese monks, and visit the Vatican seeking the modern-day practitioners of the ancient art of temple priests. We also listen to ardent debates on the ethical considerations of the profession; they are at the top of the mind of each of these scientists as they set and meet the highest standards of their unusual calling. There are 8 copies of the book in the Westchester library system. If your library does not have a copy, ask your librarian to obtain one for you. If your librarian can not help you, email me as I may be able to obtain a copy for you elsewhere.